For an eCommerce business handling subscriptions, subscription billing platform is the data center that holds payment information, order details, and shipment details. This data needs to flow into the fulfillment platform on a recurring basis. And that’s where the complexity kicks in. It becomes crucial to constantly keep a track on order updates, payment detail changes, and order statuses for recognizing revenue better. If you are using Chargebee and ShipStation or looking to jump on board with us, this can be achieved seamlessly. The tight integration we have built will be the solution to streamline your operations. What will this integration solve? Automate creation and cancellation of orders in ShipStation. Minimize errors that pop up while dealing with data across multiple spreadsheets by enabling Chargebee-ShipStation interaction. Plan inventory better by syncing SKU(Stock Keeping Unit) from Chargebee to ShipStation. ShipStation is a web-based shipping and fulfillment software that helps in automating fulfillment of orders, managing inventory, and printing labels. When orders are merged or split in ShipStation, the order status is reflected Chargebee. Have better accountability by keeping track of all the orders against one invoice. Your ShipStation account lets you configure only one currency. Overcome this limitation with Chargebee-ShipStation integration! Chargebee lets you accept payments in multiple currencies, converts them to the currency configured in your ShipStation account and then pushes the order information to ShipStation. 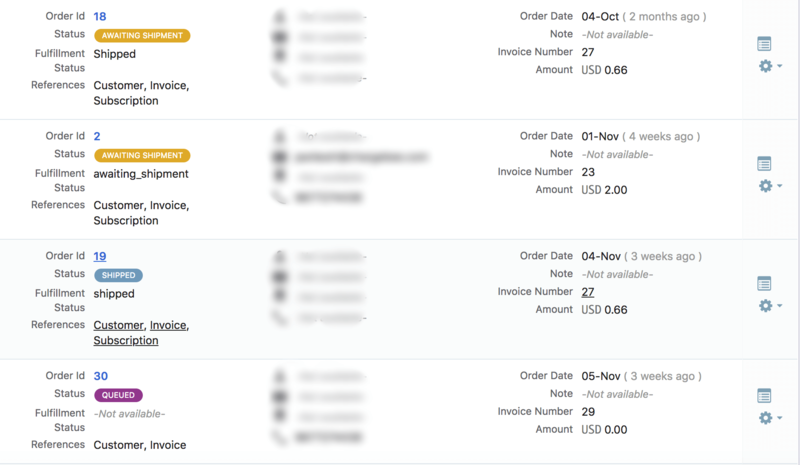 Get a consolidated overview of your Order details within Chargebee without having to switch between platforms.